Android Nougat 7.0 have come up with so many new features and functions although it doesn’t change up the basic functioning of the device. There have been added functions and security traits inside this version of Android which also tends to provide you the most secure browsing, usage. Apart from all these features, the Android Nougat’s one such feature that the users will love is the ability to change up the input language on the device. With this feature, users could use up the multiple languages on the same device by just adding up the desired ones to the list from where it could be chosen every time you need to change up the language. This was all about the feature but how can you apply it on your device? You might be wandering through the settings and options on your device to do that. So for the guys who don’t how to apply this multilanguage usage feature on their Android Nougat, we have written about the method in this article. Just follow through the article and read it up to know about the method! Below is the complete by which you can easily add new input languages right on your latest version of android that is 7. So follow the below steps to proceed. 1. First of all, you need to add up the new language that you wish to use on your device, to do that head on to the settings of your device and then from there select up the option “Language & Input“. Under that option, you can select up your languages just tap on “Add a Language” option and then pick up the desired language from the list. 2. 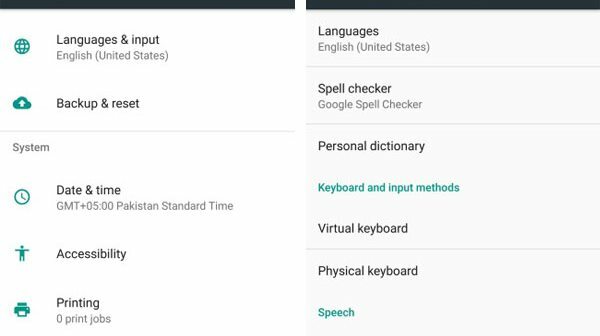 To change up the language on the Android Nougat when you open up any of the messaging apps, the keyboard layout will be in default language you have set up, just select up the language from the list that you could see from the above of the keyboard. To do that just long press on the language from the list of your added languages and then move it to the top. 3. To remove up the added language from the list again go to the Language & Input settings on your device and then tap on the three dot menu from the upper corner of the screen. From the menu that appears just select up the option “Remove” and then after that you will be enabled to delete up your added languages from the list.